The latest nano-tech research into magnets and light fields could well lead to the development of one of our favourite superhero dreams – the 'invisibility cloak'. Researchers at the FOM institute AMOLF in the Netherlands have successfully managed to power an energy transfer between nano-electromagnets with the magnetic field of light for the first time in human history. It is a major breakthrough in the long and noble scientific journey towards helping us fulfil our childhood Marvel-comic inspired dreams. Additionally, and slightly more prosaically, it is a step forward in the development of what are called magnetic 'meta-materials' which are able to deflect light rays in every possible direction. The artificial 'meta-materials' are made up of incredibly tiny U-shaped metal 'nano-rings',in which an electromagnetic field of light induces an alternating current, with the mini-magnets north and south poles alternating 500 billion times per second. 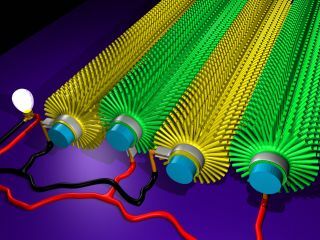 The key 'take-home' here is that it gives the researchers a better ability to understand and control how light can be deflected by such nano-magnets.